Erik Prince, founder of the Blackwater Worldwide security firm, announced Monday he has resigned as head of the company, recently renamed Xe. Prince, in an e-mail to employees and independent contractors, said Danielle Esposito will become chief operating officer and executive vice president. Esposito has worked for the firm and its partners for nearly 10 years. Blackwater/Xe’s president, Gary Jackson, is also retiring, Prince said. The position of CEO will remain open, the company said. Prince did not elaborate on what he planned to do next, saying only that “I will be taking on new challenges that I have not yet had the chance to tackle.” The State Department has decided not to renew Blackwater/Xe’s contract in Iraq when it expires in May, a State Department official told CNN in late January. That followed a refusal by the Iraqi government to renew the firm’s operating license because of a 2007 incident in which the Iraqi government says security guards — then employed by Blackwater — fired upon and killed 17 Iraqi civilians. As part of a contract to protect American diplomats and other employees around the world, the State Department hired Blackwater for a multiyear assignment in Iraq, renewable annually. Blackwater, one of three security firms working for the United States in Iraq, has one of the biggest security contracts in that country. Officials said the State Department is talking with security firms DynCorp International and Triple Canopy, which share the Iraq contract with Blackwater, about picking up the duties handled by Blackwater. The Iraqi government has been unclear about when Blackwater will have to cease operations, but the State Department official said, “We are working to make sure our people are protected.” Losing the contract will be a huge blow to Blackwater, which was renamed Xe last month. While the company is privately held, the Iraq contract has been estimated to make up one-third to one-half of its business. Blackwater/Xe has about two dozen aircraft in Iraq, as well as 1,000 personnel. Five former Blackwater security guards pleaded not guilty in January to charges of voluntary manslaughter and other serious crimes stemming from their involvement in the September 16, 2007, incident in a Baghdad square. A sixth former security guard has pleaded guilty to charges of voluntary manslaughter and attempted manslaughter. Blackwater says its employees were returning fire after they were attacked by armed insurgents, but an Iraqi investigation concluded that the guards randomly fired at civilians without provocation. The Iraqi government says 17 civilians were killed, although the indictment alleges 14 died. The company does not face any charges. But the Baghdad incident exacerbated the feelings of many Iraqis that private American security contractors have operated since 2003 with little regard for Iraqi law or life. The indictment of the five men represents the first prosecution of non-Defense Department contractors under the Military Extraterritorial Jurisdiction Act. The act was amended in 2004 to allow the Justice Department to prosecute such personnel providing services “in support of the mission of the Department of Defense overseas.” The current U.S.-Iraqi security agreement — which was approved in December — specifies that U.S. civilian contractors will no longer be immune from Iraqi prosecution for crimes committed in that country. Iraq has required the licensing of private security companies since 2004, but the provision was not strictly enforced. 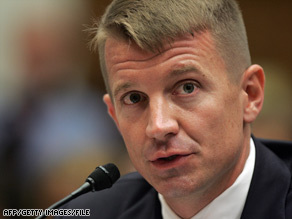 Last year, the State Department renewed Blackwater’s contract over strong objections from the Iraqi government. Starting January 1, the Iraqi government has mandated that all contractors obtain Iraqi licenses to operate.